If you use TrueView video ads or interested in video advertising, we invite you to check out the Agency blog where we just posted some news and recent stats on this new suite of cost-per-view video ads. To learn more about the TrueView family of ad formats, visit the website here. custom sneaker maker. Or you run a yoga retreat center. Or maybe you even sell vegan Vietnamese out of a gourmet food truck. Your business has its own unique story to tell. If you had the chance to show the world what your business is all about -- from its founding roots to the ways it changes your customers’ lives -- would you take it? Today you have that chance. We’re pleased to be presenting "My Business Story®" alongside American Express. “My Business Story” is a program for small businesses to tell their stories through video, leading up to the second annual "Small Business Saturday," a day set aside to encourage communities to spend and support local businesses by shopping small. And since Google research has shown that companies who use video can expect better customer engagement and retention, we are launching a new video tool so that small business owners can create personalized, professional-quality videos about their business. Once you’ve got your video crafted, business owners are invited to submit it to the contest for an opportunity to appear in the YouTube homepage ad on Friday, November 25th, which is viewed by an estimated 22 million people in the United States every day. Thirty-six small businesses will be featured in the ad and will receive an online ad campaign worth $5,000 from Google and American Express. All submissions will be viewed and judged by an independent panel of experts. The deadline for the contest entry is Tuesday, November 15, but entry is not required to use the My Business Story editing tool. Happy editing! We’re eager to see what you come up with. Let’s say you’re a custom sneaker maker. Or you run a yoga retreat center. Or maybe you even sell vegan Vietnamese out of a gourmet food truck. Your business has its own unique story to tell. If you had the chance to show the world what your business is all about -- from its founding roots to the ways it changes your customers’ lives -- would you take it? , which influences your ad's position. But with bid-per-call, your bid for phone calls and phone call Quality Score can directly factor into your Ad Rank, too. Higher ranked ads are more likely to be seen and can therefore generate more phone calls (and clicks, too). Summaries of completed calls, phone-through rate (PTR), and phone call cost on the Ad Group and Campaign tabs. Details for each call, including call time, duration, caller area code, and the ad group that drove the call on the Dimensions tab. At this time, bid-per-call is available only in the US and UK. Max CPP bids are set at the ad group level. And each ad group must meet certain minimum click and call thresholds. If you're already using Call Metrics, you must enter a Max CPP bid in order to activate bid-per-call. In the AdWords Help Center, you can find details on how bid-per-call works with Ad Rank and the AdWords auction, and general FAQs about call extensions. For the latest updates on bid-per-call and other useful features, please visit Google Ad Innovations. Over the next few weeks in the US and UK, we'll be rolling out the ability for advertisers to bid for phone calls -- in addition to bidding for clicks -- when they show Google search ads on computers and tablets. Let's say your business sees phone calls as a valuable lead source. You're willing to pay up to $5 for a phone call and up to $1 for a click from a prospective customer who searched for "caribbean cruise" on Google search. Today, a combination of your ad's Quality Score and max cost-per-click (CPC) bid determine your Ad Rank, which influences your ad's position. But with bid-per-call, your bid for phone calls and phone call Quality Score can directly factor into your Ad Rank, too. Higher ranked ads are more likely to be seen and can therefore generate more phone calls (and clicks, too). and new metric on the performance of Seller Ratings on Search Ads. With the recent international launches of the Ad Innovations site, we want to take a minute to call out a few simple things you can do to quickly improve the performance of your AdWords ads. Give the tips below a try and see how our Ad Innovations can improve your performance. Ad Sitelinks allow you to extend the value of your existing AdWords ads by providing additional links to specific, relevant content deeper within your site. Rather than sending all users to the same landing page, Ad Sitelinks will display up to four additional destination URLs for users to choose from. On average, advertisers see a 30% increase in clickthrough rate (CTR) for the same ads with Ad Sitelinks. We recently made a change to top ads that allows you to display more information where it’s most likely to be noticed--in the headline. By taking information from the first description line and moving it to the headline, we found that we’re able to create a better user experience and improve advertiser performance. In fact, ads with longer headlines receive a 6% average increase in CTR compared to the same ads with a standard headline and description. To increase the chances that your ad will appear with the longer headline, make sure that description line 1 is a complete phrase or sentence and ends in punctuation (e.g., a period or question mark). Location extensions allow you to extend your AdWords campaigns by dynamically attaching your business address to your ads. In addition to the description lines and URL that appear in your ad text, your ad can also display your business name, address, and phone number. This helps promote your business brand, products, and services and associates your business with a specific location of interest to the user. By linking a Google Places account to your AdWords ads, you can quickly and easily make sure all your location information is available when it’s most relevant. Make it easy for users to review you--include links to your site's page on the third-party review sites used by Seller Rating Extensions. Product extensions are a way for you to enrich your existing AdWords ads with more relevant and specific information about your retail merchandise. Product extensions allow you to use your existing Google Merchant Center account to highlight your products directly in your search ads. With product extensions, you're charged the same cost-per-click (CPC) whether a user clicks on your main text ad or any of the offers within the product extensions plusbox. Of course, you can always learn about the many additional AdWords innovations by visiting the Ad Innovations website and subscribing for the latest updates. This blog post is outdated. Please refer to this article for Google Customer Reviews and new metric on the performance of Seller Ratings on Search Ads. Not sure how to most effectively leverage and measure your mobile marketing campaigns? Well, you’re not alone. While mobile is an incredible new way to distribute content and reach customers on the go, it also presents a unique challenge when it comes to measuring the impact of our mobile efforts (which may include applications, advertisements and/or mobile-optimized websites). How can you do this intelligently, and at scale? Audience Solutions on the Google Display Network (GDN) provides the insight you need, connecting potential customers by with exactly what they are looking for -- when they are ready to buy. Register here for the webinar to be held on November 1st, 2011 at 10:00am PST / 12:00pm CST / 1:00pm EST. You can also preview a video of this invite here. Advertising is about getting your message in front of the right people. Whether you need to increase brand awareness or maximize ROI on direct response campaigns, your challenge continues to be about delivering the right message to the right person at the right time. Starting today, if you’re running display ads through the Google Display Network, you may begin seeing the +1 button and annotations with your ads. Now, with a single click, people can recommend your ads’ landing pages to their friends and contacts. As we explained in our initial announcement several weeks ago, we believe that incorporating personal recommendations into display ads has the potential to change the way people view advertising. A display ad becomes much more powerful when people can see which of their friends and contacts have chosen to endorse it. We’re working to add the +1 button and annotations to all eligible inventory over the next couple weeks. So while you might not see them immediately, we’re working hard to roll them out to all advertisers as quickly as possible. 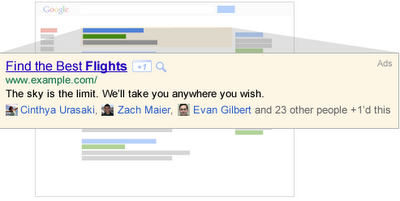 To learn more, you can read our initial announcement or visit the AdWords Help Center. 1 that increased the weight given to relevance and landing page quality in determining Quality Score and how ads are ranked on Google. The goal was to improve the user experience with search ads. Based on the results we’ve been seeing, we’re now rolling these changes out globally over the coming weeks. As the changes roll out, some campaigns will see variation in keyword Quality Scores and typical ad position. Within a couple weeks, things should stabilize and we expect most campaigns will not see a significant change in overall performance. Just like today, campaigns with better-performing ads for user queries will continue to see higher Quality Scores, lower average cost per click and higher position on results pages. The 1-10 Quality Score in the AdWords interface will continue to represent the general quality of your keyword when exactly matching a search on Google. Increases in bid and Quality Score will continue to increase Ad Rank. And the same basic approach to improving your results with AdWords applies. 1Google Translate versions of the local Inside AdWords announcements: Brazil, Spanish-speaking Latin America, Spain, Portugal. 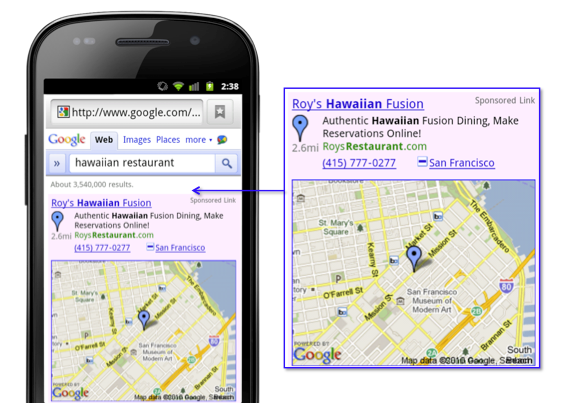 When searching on Google, users appreciate results that are relevant and deliver a great experience after they click. In August, we announced trials in Brazil, Spanish-speaking Latin America, Spain, and Portugal1 that increased the weight given to relevance and landing page quality in determining Quality Score and how ads are ranked on Google. The goal was to improve the user experience with search ads. Based on the results we’ve been seeing, we’re now rolling these changes out globally over the coming weeks. When CafePress first started printing shirts in 1999, online retail was still a nascent industry and Google had yet to sell its first ad. Soon CafePress started selling products through search ads on Google, and their business took off. Today, CafePress hosts millions of shops online where customers can choose from more than 325 million products on nearly any topic, from wall art to phone cases. Just as CafePress has broadened its offerings over time, we've also worked to improve and expand our search advertising products. What started as three lines of simple text has evolved into ads that are multimedia-rich, location-aware and socially-amplified. Today CafePress uses Sitelinks to direct people to specific pages of their website, helping customers find what they’re looking for faster. On average, ads with three rows of links, or three-line Sitelinks, are more than 50 percent likely to get clicked on than ads without Sitelinks. More than 200,000 advertisers have joined CafePress in using Sitelinks in at least one campaign. Monday at Advertising Week in New York City, I’ll be talking about how advertisers have been quick to adopt these new formats since we first began experimenting nearly two years ago. Businesses from the smallest retailer in Idaho to the largest Fortune 500 company in New York have seen how these innovations in search advertising can help grow successful businesses. In fact, roughly one-third of searches with ads show an enhanced ad format. Visual. Not only can you find theater times for a new movie, you can watch the trailer directly in the ad. Media ads put the sight, sound and motion of video into search ads. With Product Ads, people can see an image, price and merchant name, providing a more visual shopping experience. Because this format is often so useful, people are twice as likely to click on a Product Ad as they are to click on a standard text ad in the same location, and today, hundreds of millions of products are available through Product Ads. Local. More than 20 percent of desktop searches on Google are related to location. On mobile, this climbs to 40 percent. Location-aware search ads can help you find what you’re looking for more easily by putting thousands of local businesses on the map—literally. More than 270,000 of our advertisers use Location Extensions to attach a business address on at least one ad campaign, connecting more than 1.4 million locations in the U.S. via ads. And, with our mobile ad formats, not only can you call a restaurant directly from the ad, you can also find out how far away the restaurant is located and view a map with directions. Social. With the +1 button people are able to find and recommend businesses with their friends. Since introducing the +1 button earlier this year, we now have more than 5 billion impressions on publisher sites a day. If you’re a business owner, the +1 button enables your customers to share your products and special offers easily with their network of friends, amplifying your existing marketing campaigns. We're continuing to experiment with search ads to help businesses like CafePress grow by connecting with the right customers. Starting today, you can drop by our site to check out what’s new with search ads and learn about all the improvements we’ve been working on recently. We’re developing ads that provide richer information to you because we believe that search ads should be both beautiful and informative, and as useful to you as an answer.